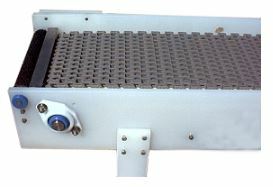 Powered Roller Conveyor – BNB Industries, Inc. These are used for transportation conveyors. 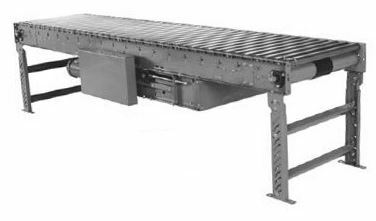 Product is conveyed directly on top of the rollers, great for horizontal conveying of product while allowing for transfers, side loading or light pressure accumulation of the product on conveyor. Product to be conveyed needs a flat smooth bottom, nothing to get caught between rollers as product is conveyed. Examples of products: Boxes, totes, buckets, pails, pallets, bags or lumber. Light duty or Medium duty applications, rollers are driven by a conveyor belt under the carrying rollers, the driving force of the rollers can be adjusted for some accumulation of product (2%-3% back pressure). 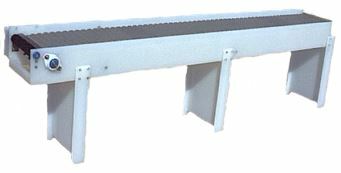 Conveyors can be reversed in direction with the use of center drive. Frame: 6-1/2” x 1-1/2″ x 12ga. Formed Channel frames that are slotted for tread rollers to pop-out. Straight, Curved and Curved Spur sections available. Frame: 7” x 1-1/2″ x 12ga. Formed Channel frames that are slotted for tread rollers to pop-out. Frame: 7” x 1-1/2″ x 10ga. Formed Channel frames that are slotted for tread rollers to pop-out. Light duty applications (15 lbs per roller load capacity), rollers are driven by a drive shaft that runs the length of the conveyor with spools and drive belts that connect to the carrying rollers to drive the rollers. 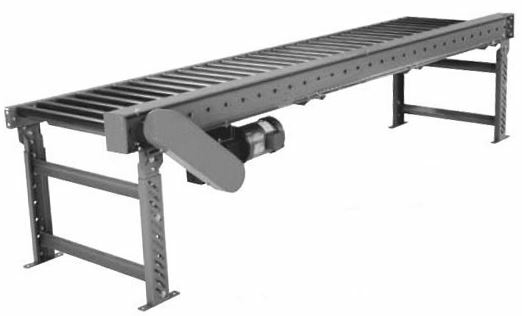 Line shaft conveyors usually require less drives for the application saving cost and reducing utility costs. Medium duty or Heavy duty applications. Best for oily or dirty applications where conveyor belts won’t work. 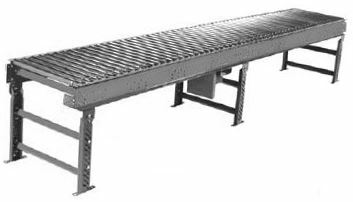 Used for filling stations and good for pallet conveyors with heavier loads. Frame: 5-1/2” x 1-1/2″ x 10ga. and 3-1/2” x 1-1/2″ x 10ga Formed Channel frames. Frame: 6” x 1-1/2″ x 7ga. and 4” x 1-1/2″ x 7ga Formed Channel frames.